Thus far, my favorite Star Wars novel is Steve Perry’s Shadows of the Empire, which takes place between the film The Empire Strikes Back and The Return of the Jedi. Familiar characters from the film are necessary, but Shadows also introduces the memorable Dash Rendar, and by fleshing out what happened between Han Solo’s freezing in carbonite and Luke and Leia’s rescue, Perry’s novel seems quite organic. There have been quite a few Star Wars based novels published since Shadows, but with the upcoming new Star Wars movie, it is natural that a new story, with the original characters, come to market, along with a zillion tee shirts. So, we have James S. A. Corey’s Honor Among Thieves, which takes place between A New Hope and The Empire Strikes Back, as Han continues to try to raise money to pay Jabba the Hutt, and Leia is involved in leading the rebellion, which is not just a war, but a fund raiser. Someone has to pay for all those X-wings. Anyway, a valuable spy sent a message indicating that she needs to be recalled, and Han needs the money, so he’s off to make contact, pick up Scarlet Hark, and pocket another reward. Nothing in their universe (a long time ago in a galaxy far, far away) is simple, however, and Han’s little errand gets complicated really quickly. One of the best ways to create suspense is to raise the stakes, and they are quite high in this novel. No, there is not a Death Star (twice is one too many IMHO) but a device that kills hyperspace travel is high stakes indeed, and Han, Leia, and Luke end up converging in an effort to wrest control of the hyperspace dampener from the Empire. To be honest, I didn’t like Honor Among Thieves as much as I did Shadows of the Empire, but I did like it. 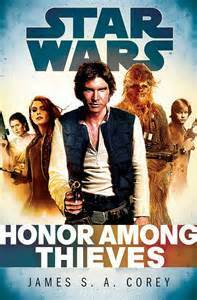 Readers who want to revisit a young farm boy Luke, the pivotal Princess Leia, and the roguish Han Solo should pick up or download a copy of Honor Among Thieves. Before you know it, you’ll be right back in the groove, wondering when Darth Vader will swoop back into the action. This is a great way to get in the mood for the new film. A friend mentioned that she had seen and liked Monuments Men when it was in theaters, but I didn’t get around to seeing it then. However, it is out on DVD so hubby put it in the Netflix que, and we saw it recently. The cast is, perhaps, the best part of this effort. Lots of big name stars have roles, including Matt Damon, George Clooney, John Goodman, and Cate Blanchett. Essentially, this is the story of the men tasked with finding and protecting the art which was stolen by the Germans during World War II. The script is good, but not especially memorable. In this film, however, the dialogue takes a back seat to action and suspense. And, there is certainly an element of education in the film. In order for the suspense to work, the audience must come to care about the historical artifacts and those who worked so hard to restore them to their rightful places. As my friend said when she recommended it, the movie isn’t great, but it is good, and it helps modern viewers appreciate the risks and hard work of those who went to war to help preserve these works. Oddly, there are few people now who care enough to publish accounts of the destruction of art, as is happening in the middle east, much less go to war over it. When I was younger, one of the genres of movies and television that was quite popular was stories from World War II. While I wasn’t alive for it, of course, many in my parents’ generation had fought or knew those who had. Indeed, on a wall in my house is a framed picture of my uncle, A.L. Dodd, Junior, who was killed a few weeks before the end of the war in Europe; he was in Germany, in the Ruhr valley, when he was shot by a German machine gunner. So, the war was quite real to us. We enjoyed the stories, because they were entertainment, but knew that the war had affected most everyone in America. After seeing the film Unbroken, directed by Angelina Jolie, I was telling my sister about it, and she said, “Clearly, you don’t know the whole story. Read the book.” And, with lots of other reading and a bit of teaching, it was almost six months after hearing that advice before I got around to reading the book by Laura Hillenbrand. OMG, why did I wait so long? The movie is very good, but the book is great. Maybe I waited, in part, because I don’t usually like biographies. As told by Hillenbrand, Louis Zamperini was quite a character, from his earliest days. His parents didn’t quite know what to do with him, and he might be described as a juvenile delinquent. His brother convinced the school authorities to allow Louie to get involved in sports, and Louie was gifted in running. So gifted, in fact, that he became an Olympic runner, and a very good one. He might have known even more fame as a track star, but World War II got in the way. After his plane crashes in the Pacific, Louie and two other Army Air Force survivors were adrift for a very long time. Then, on the brink of death, they were captured by the Japanese. Yes, Louie was still alive, but he faced incredible brutality. One of my elderly friends is a survivor of a Japanese POW camp in the Philippines. She was interned there as a child, one of several children of a missionary who fled there from China, because the parents thought that being in a U.S. territory was safer for their children. The treatment she and other family members endured was brutal, and toward the end of the war, the prisoners were scheduled to be executed before the Japanese withdrew. She was saved because some American volunteers broke down the fence and escorted the POWs to safety. My friend, to this day, cannot understand Americans can embrace Japan as our friends and allies. To her, they were a barbaric enemy, who starved her family and killed far too many non-combatants. Hillenbrand does explain the brutality, through Louie’s account, and accounts by other prisoners. But she reinforces the brutal nature of the Japanese POW camps with survival statistics. According to Hillenbrand, only 1% of American POWs held by the Germans or Italians (the European theater) died, but in Japan 37% died. She also goes into the cultural differences which led to the cruelty, not as an excuse, but to let readers know more about the “why” which must come to the mind of her readers. The film, Unbroken, closes with the end of the war. That is a good stopping point for a Hollywood film; the audience can go home knowing Louie made it out alive and was welcomed home by his loving family. But, as my sister noted, there is more to the story. 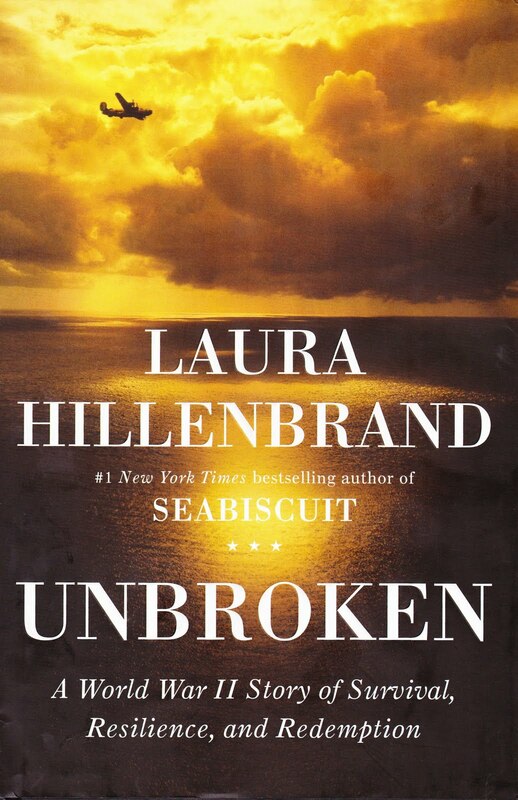 The book has a subtitle Unbroken: A World War II Story of Survival, Resilience, and Redemption and it is appropriate. While I do not fault Jolie for leaving out the “redemption” part, the story is incomplete without Louie’s problems adjusting to “normal” life after the horrific experiences he had in Japan and how finding religion gave him the peace he desperately needed. The author continues to cover multiple story lines, including “Phil” the pilot to “the Bird” who was the most sadistic of the Japanese prison guards. The entire story is important, and those who watch the movie get only the middle, so I encourage readers to tackle the book by Laura Hillenbrand. While it isn’t a quick read, it is certainly worth your time.